died 9th November 2016 aged 69. 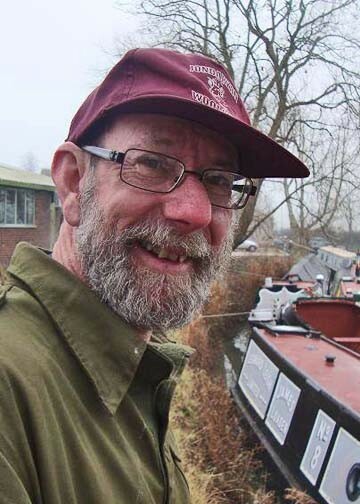 Steve will be missed by many who met him and worked with him in the multiple aspects of waterways life that he was involved with over the years. These have included Northampton IWA, The Buckingham Canal Society and The Friends of Raymond. He had worked as a professional photographer and a motor parts salesman, before becoming a canal boat maintenance worker with Trevor Morley who operated the trip boat Linda from Cosgrove Wharf. Steve ended up operating the boat for Trevor and eventually bought Linda and contributed to keeping the channel clear between Cosgrove and Stoke Bruerne owing to the boat’s deep draft. In time, he sold Linda and converted a younger boat to continue canal trips. But finally the trip boat was sold to Richard Hyde and Steve took to other occupations. The most public of these was as an author, writing under his own name and his pen name ‘Geoffrey Lewis’. He self-published under the guise of ‘SGM Publications’. Steve’s middle name was Geoffrey, but where the ‘Lewis’ of his pen name came from remains obscure. His extensive catalogue includes detective fiction, and a series following a young runaway’s progress to become a Number One narrowboat man. Steve also published a photographic record of the many American cars which he first encountered during his Oxford childhood due to the local American Air Force presence after World War 2. There are now 15 volumes in the “Over Here” series. In addition he helped others to publish their own memories, the most notable of which is “A Horse, a Boat and You” by Alice Lapworth, who was born on a narrowboat. Steve’s dedication to the waterways had a positive impact through the societies he belonged to and through his own individual efforts. He was an early member of the Buckingham Canal Society and at one time was its chairman. Perhaps an equally important role was as Trustee and Chairman of The Friends of Raymond. On an individual level he played a significant role in persuading British Waterways to take action about trees growing over the canal and obstructing safe navigation. He did this by taking pictures of problem areas, forwarding them to James Griffin of The Wyvern Shipping Company who in turn brought pressure to bear on British Waterways. Steve and his knowledge, imagination and generosity of spirit will be a loss to many. Let’s hope there are boats, or American cars, wherever he is.